How do I use coaching assessments and forms with my coaching clients? You can easily create your own personalized assessements and forms which you can assign to clients. Your client will be able to post answers to your assessments, and you will be able to comment on their responses. You can create assessments in one of two ways. If you already have coaching clients registered, you can go directly to Coaching Management (under the Coaching and Courses drop down). Here you will see a list of your Active clients, Inactive clients and Prospects. Clicking on any name will drop down a range of tools. Click on Assessments and Resources. From the Assessments and Forms tab, you can create and assign Assessments. 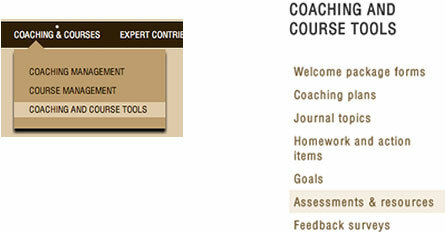 Or you can create assessments from Coaching and Course Tools (under Coaching and Courses). Just click on Assessments and resources in the left hand panel. 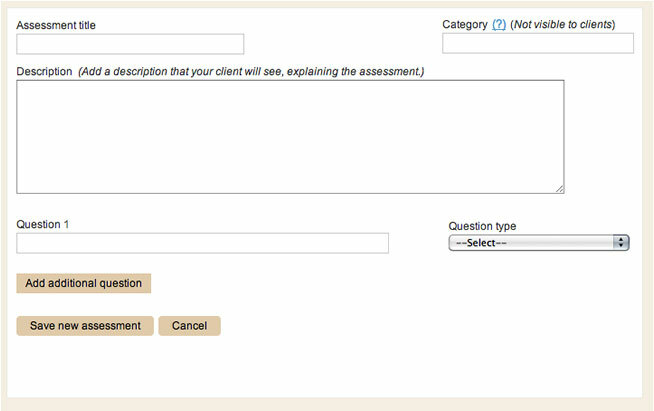 No matter which page you choose, there will be a button in the main box saying "Create an assessment." Click this button and an area will drop down where you can create your assessment. Choose a title and write a description. Give any instructions here that your client will need for responding to the assessment. 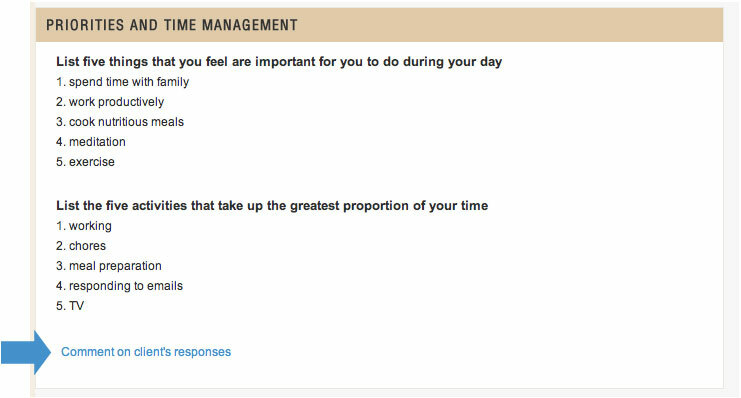 You can also choose to group your assessments into categories for your own private use. You can create additional categories at any time by typing into the field marked Category. Next, create your questions. These can be in the form of Yes/No, short answer, paragraph or multiple choice. If you choose multiple choice, create each alternative your client can choose from. You can create as many questions as you like—just click on "Add additional question." All your assessments created for either coaching or courses will be listed in the table so that you can easily assign them to multiple clients and courses. You can sort these to display in any way you like. You can edit your assessments by clicking the link View/edit assessment then selecting Edit. After making your changes, if you select Save edited assessment, the assessment will be edited with your changes (this option is only available if the assessment hasn't been responded to by anyone yet). If you choose Save new version of assessment, your edits will create a new version of the assessment. You can assign assessments from the Coaching Management page. Just click on the client's name you want to assign the assessment to from list of your clients on the left-hand side of the page, and then select Assessments and resources from the drop-down menu. In the column marked Assign Date, click the link Assign or the calendar icon and select a date. This is the date your client will be able to see your assessment. What does my client see from their dashboard? 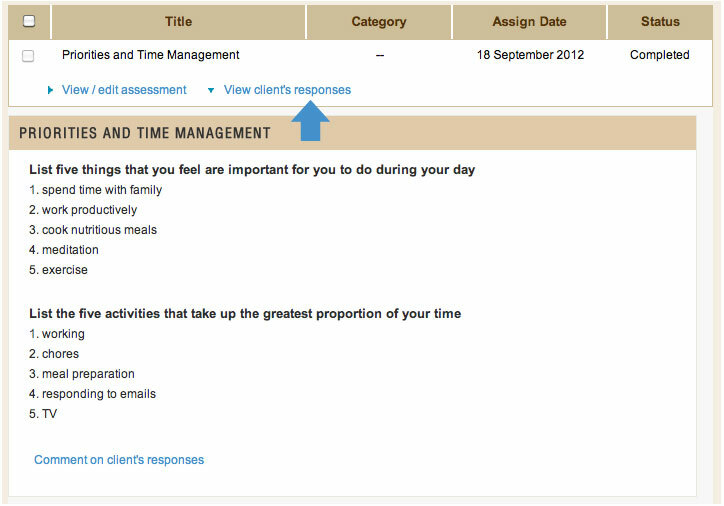 Your client will be able to respond to your assessments from the Coaching Pad in their dashboard. How do I view completed Assessments and Forms? You can read your client's responses to your assessments from the same page where you created the assessment (the Assessments and resources page in Coaching management). Once your client has submitted the assessment, "Client's responses pending" will change to "View client's responses." Click on this link and the questions and answers to the assessment will drop down. To comment, just click the link Comment on client's responses at the bottom of the assessment. Clients can comment back, and this way you can have a productive exchange regarding your client's self assessment, drawing out meaning from their responses, and using it to further your client's success towards their goals.